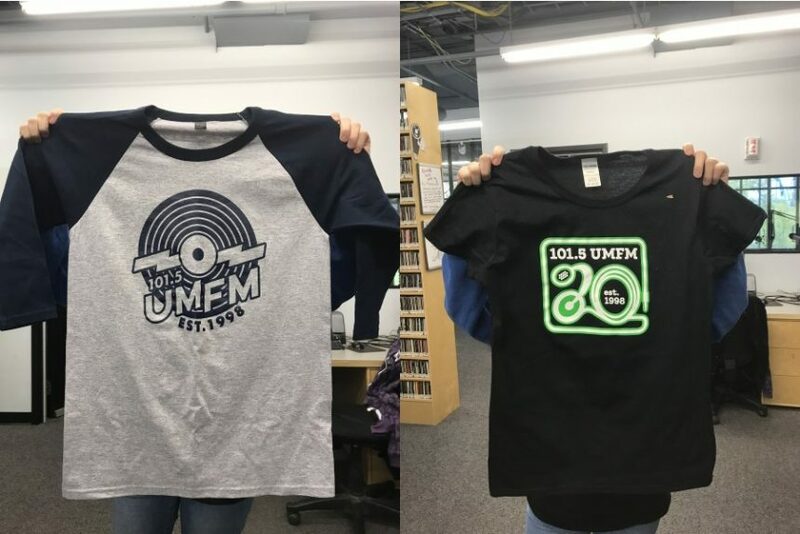 UMFM celebrated 20 years of broadcasting in September, and what a couple of decades it’s been! I remember the dark, lonely days before campus & community radio rejoined the fm airwaves, and I remember what a huge hole was blown into my awareness of great music and events in this city. I had no idea that there were so many incredible local bands, nevermind the countless acts that I discovered from elsewhere. It really wa a grand awakening for me. I’ve loved and relied on the radio all my life, and I’d already been somewhat involved in broadcasting before then, but this new medium in Winnipeg rekindled something in me and had me yearning to get involved. I really felt like UMFM could be a place that I could fit in, and I felt like it might be possible for me to make a difference there. It took a few years for me to get my confidence up, polish up the right volunteer application, and get a lucky break. I still remember getting the call and excitedly phoning everyone I knew to tell them that my dream was coming true. It felt like the beginning of something wonderful in my life, but I had no idea at the time just HOW wonderful and important it would be. For almost 18 years I have been blessed to be a host with CJUM 101.5 UMFM in Winnipeg, where I strive to spread the word about great music and culture. It is our sincere hope that what we do makes a difference in the lives of artists and fans, and experience feedback tells us that we’re doing a pretty good job. We hope that we play a vital role in encouraging and spreading music and information. Over the years, the cost of running a radio station has steadily increased, and sadly, our funding from the University has not kept pace. We’ve done as much as we can to cut costs, increase revenue, and run things as efficiently as possible. Over the past 6 years, we have been overwhelmed by the response to Pledge-O-Rama, which has helped us to become a stronger, more sustainable station. That support energized us and helped us to make the station even stronger and smoother running, and helped us to plan for a more stable, sustainable future. We’d love to keep the momentum going, so UMFM will again be running our annual funding drive, Pledge-O-Rama, October 12-19, 2018. Supporting the station and the great information and music that we promote makes you an official Music Angel, and it entitles you to our ongoing heavenly thanks and praise. As our thanks to YOU for helping us, we’ve got some dandy gifts for you. You can choose to either make your donation TAX DEDUCTIBLE and receive a receipt, OR you can choose the package corresponding with the amount you donate. As always, you can choose to split up pledges however you wish, so if you really want a an incentive or two, but nothing else, you could make one pledge for incentives and direct the rest as a separate tax-deductible donation for another amount, or split things up however you wish. You can also support multiple shows/hosts with your pledge. $25 – UMFM’s Friends With Benefits Card, UMFM Stickers and a set of two UMFM Enamel Pins! $50 – UMFM’s Friends With Benefits Card, Stickers, a set of two UMFM Enamel Pins, and a new UMFM coffee mug! $75 – UMFM’s Friends With Benefits Card, Stickers, a set of two UMFM Enamel Pins, a new UMFM coffee mug, and your choice of the 2 new 2018 Plege T-Shirts! 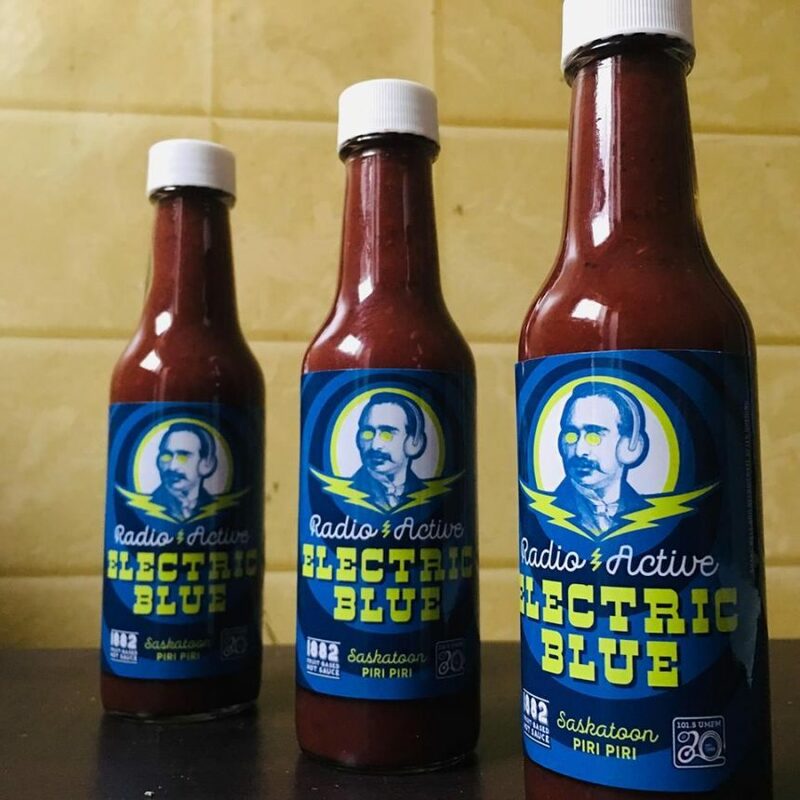 $101.50 – UMFM’s Friends With Benefits Card, Stickers, a set of two UMFM Enamel Pins, a new UMFM coffee mug, your choice of the 2 new 2018 Plege T-Shirts OR a UMFM hat, and our new exclusive UMFM Hot Sauce, “Radio-Active Electric Blue,” lovingly created by 1882 Fruit Based Hot Sauce! $150 – UMFM’s Friends With Benefits Card, Stickers, a set of two UMFM Enamel Pins, a new UMFM coffee mug, your choice of the 2 new 2018 Plege T-Shirts, a UMFM hat, our new exclusive UMFM Hot Sauce, “Radio-Active Electric Blue,” lovingly created by 1882 Fruit Based Hot Sauce, and 1 entry into our special Golden Ticket draws – there’s 7 of them! $250 – 2 UMFM Friends With Benefits Cards, Stickers, TWO sets of two UMFM Enamel Pins, TWO new UMFM coffee mugs, TWO new 2018 Plege T-Shirts, TWO UMFM hats, TWO bottles of our new exclusive UMFM Hot Sauce, “Radio-Active Electric Blue,” lovingly created by 1882 Fruit Based Hot Sauce, a new UMFM hoodie, and 3 entries into our special Golden Ticket draws – there’s 7 of them! Let’s make a deal! Any pledge over $101.50 is negotiable! Talk to us about what you want and we’ll work something out! Please be aware that we cannot set aside specific t-shirt sizes during Pledge-O-Rama. All of our shirts will be distributed on a first come, first serve basis. $75 – Half Pints Brewing daily draw/grand prize – at the $75 level and above, you are entered into a draw for a Half Pints prize pack (one draw per day of Pledge-O-Rama!) and for the grand prize, a private brewery tour & tasting for you and up to 20 friends, after which you’ll leave with a gift certificate good for a keg of your choice! $101.50 – Everyone who pleges at this level or above will be entered into a draw for a pair of tickets every time we present a concert throughout the year. These draws are individual, so there will be MANY chances to win! $250 The Famous Golden Ticket! – If lucky enough to be selected for one of the 7 golden tickets available, you and a guest will be able to attend EVERY show taking place at either The Park Theatre, The West End Cultural Centre, The Good Will, The Pyramid Cabaret, or the Handsome Daughter, as well as a pair of full tickets to the Jazz Winnipeg Festival or The Winnipeg Folk Festival! IN ADDITION, Tell the Band to Go Home and Steel Belted Radio have amassed the following prizes, which are EXCLUSIVE to those shows. Again, Pre-Pledgers get an added bonus, because you can PICK YOUR PRIZE PACK! Everyone who pledges can choose a prize pack, but if you want specific items, PLEDGE NOW! NEW: Prizes are literally FIRST COME, FIRST SERVED! No more messing around trying to make the perfect prize pack, you get your pledge in early, you get rewarded. You can choose ONE item off of the list for every one of the above prize levels that you meet or beat (so a $25 pledge gets you one item, $50 gets two, but we’ll max it out at 5 after $150.) If you have another idea, we can work something out. And, once again, Pledge-O-Rama is the only place to get the annual, now legendary “Best of” compilation CDs! This year’s Best of 2017 CDs will feature a CD of mellower music, a CD of rockin’ recordings, a bonus collection, and/or a convenient .mp3 collection (featuring bonus tracks not available on audio CD) for your car or to load onto your digital device!